Match the Grind to Your Brewing Method! something to look forward to. However, where coffee is concerned, the daily grind can and should be one of life's greatest simple pleasures. The tricky thing about grinding coffee is that it must be ground specific to your preferred brewing method. Coarse, Medium, and Fine Grinds/A Clear Picture! NOTE: Although it helps to hold your mouth just right while using a blade grinder, it is well known that Quality Espresso and Turkish grinds can only be accomplished with a more expensive burr grinder. O.K., O.K., So What Grind-For What Maker? The way you grind your coffee has a huge effect on the way it tastes. The following chart will help you with a good starting point. Remember, this information is not about my perfect cup, its about yours! So, providing you with a good starting grind is "Mission Accomplished" for me. From there you can adjust to your hearts content until you find your own personal "Coffee Nirvana." O.K.? Here Goes! Well, uh... that would be for the uh... Turkish Style Coffee, yeh, that's it! So how does all this rocket science translate into the perfect grind for the perfect cup? Well, there are probably a thousand different styles and makes of grinders available for home use but there are only two types. One is called a Blade Grinder (or coffee mill) and one is called a Burr Grinder. Which one is right for you? I thought you might ask! The answer to that question is a question. The good news is that a blade grinder will get the job done for most people who make coffee in a Drip Maker, Toddy Maker, or French Press. In other words, blade grinders are functional for all but fine to super-fine grinds such as Espresso or Turkish. They are simple and inexpensive. #1. They are a bit messy and noisy. Would you rather be awakened by an obnoxious sound or a pleasant aroma? #2. Since the coffee is not really ground but pulverized, it lacks consistency which means extraction is not as smooth and complete. Putting some pressure on the top or in some cases holding pressure on a button causes the blade to spin, pulverizing the coffee beans. Blade grinders are handled manually so they have no settings. That's why, with this grinder, you need to be familiar with the different grinds because this little operation is done by a combination of timing and uh... well, your basically gonna eyeball the darn thing! O.K.? The longer you grind, the finer the grind will be. Not to worry. This is actually much easier than it may sound. First of all, How much coffee do you use? I like my coffee strong, so for a 15 cup maker I fill the reservoir as full as I can. If I can still get the lid on, I'm happy. A good rule of thumb for most people though, is to start with two tablespoons of coffee beans for every six to eight ounces of water and adjust to your taste. Now, once the grinder is loaded, don't just hold the button down and let it rip... use short bursts of a few seconds each so the coffee doesn't overheat. Make sure you have a hold on the top of the unit and give it a shake during bursts so that the grounds get well mixed while grinding. This will make the grind much smoother and consistent. For a coarse grind, 8-10 seconds, a few seconds at a time should do nicely. For a medium grind, try short bursts that add to 10-15 seconds, and a fine grind would be a few seconds or more longer. Experiment and have fun. O.K. 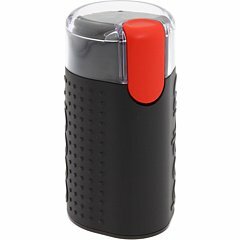 So what's the big deal about burr grinders? Well, I'd have to say precision and versatility. Yes, if you spend a bit more money, you can wake up in the morning and precision grind coffee before you even get the sleep out of your eyes. 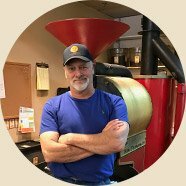 Your world's best coffee beans fall down between two burrs that have been pre-set (by you) allowing accurate grinding for the brewing method of your choice. Your coffee shall henceforth be ground perfectly, day in and day out. Due to variations between manufacturers you may still need to experiment some with different settings. You may find that the recommended settings need to be adjusted to your taste. Once you get the settings right for your "Perfect Cup", well, then my friends, its what you might call a "No Brainer!" A burr grinder will grind coffee accurately for any purpose from French Press to Espresso to Turkish. It is truly an all purpose grinder. 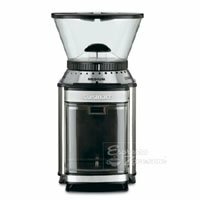 This is a Bodum Mill (Blade) Grinder. It is inexpensive, dependable, and despite the slight learning curve and minor drawbacks discussed above, it's really kind of fun to use. This is Cuisinart's Burr Grinder. This model is in the $50 range. 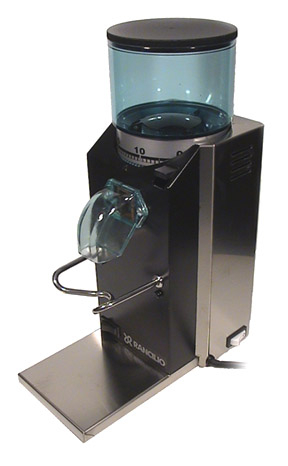 It is a precise grinder, easy to clean, easy to use, and looks nice on the counter. I have given this grinder as a gift. It gives years of service and I've had zero complaints. This is our favorite precision Burr Grinder for home use. It's nice to look at, easy to use, and...in case you hadn't guessed... expensive. Definitely for those who demand the very best! I hope you found our "How to Grind Coffee Properly" page informative and helpful. If you have any remaining questions or suggestions for this page, please see my contact page. I answer all contacts. When you purchase that beautiful new grinder, please consider giving Lakota Coffee Company's world wide selections a try. It truly is "The World's Best Coffee". I know that you won't be disappointed! Thanks for visiting our "How To Grind Coffee Properly" page!